May 9th, 2010 by KTU | Filed under Notes on Approaches. The solution was not hard, but it does require some special tools. I ground and polished the floor with a series of diamond grinding and polishing pads. This took about 30 minutes and was highly effective. You definitely need the right tools. First, you need a variable speed angle grinder. I have the Bosch 1803EVS. You need the variable speed model because the fixed-speed model spins too fast for the diamond pads. You’re going to run the grinder at about half speed. Then, you need a rubber/velcro back holder that screws onto the angle grinder shaft. Finally, you need diamond polishing pads which use a velcro surface to stick onto the rubber back holder. The velcro system is excellent. I bought a kit containing the rubber back holder and 50, 100, 200, 400, 800, 1600, 3000 grit pads. For my purposes I needed only the 100, 200, and 400 pads, and it might be less expensive to just buy those three discs and the back holder separately. 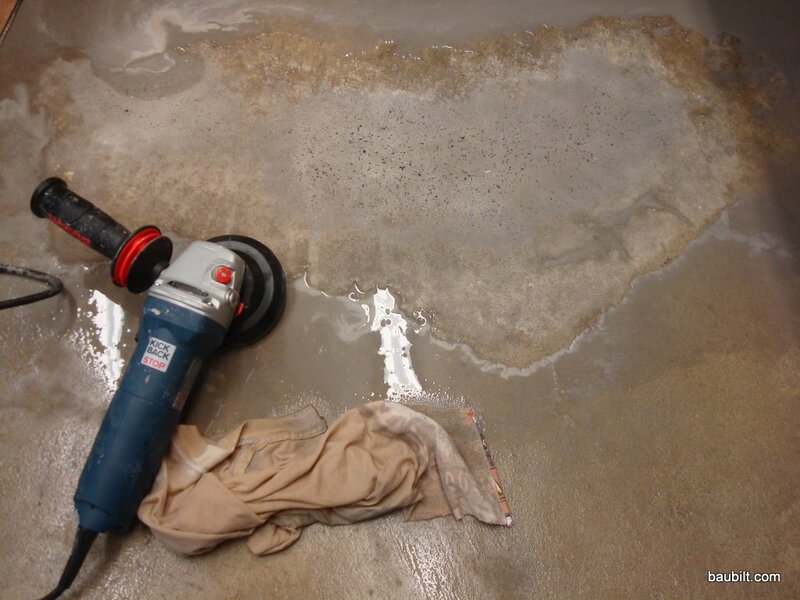 The 100 grit pad pretty aggressively removes material and the 400 pad leaves a very smooth terrazzo-like surface. If you were polishing granite to a mirror finish, you’d need the other pads. You really need to grind and polish wet. Otherwise, dust will fly everywhere and the pads will wear quickly. However, the water is easy. I just filled a water bottle and squeezed water on the floor as needed to keep it wet. You do get a fine mud everywhere, but I put building paper up around the perimeter of the area I was working on and the mess was very well contained. I didn’t even move my desk or items from around the area. Following is a photo of the finished surface. 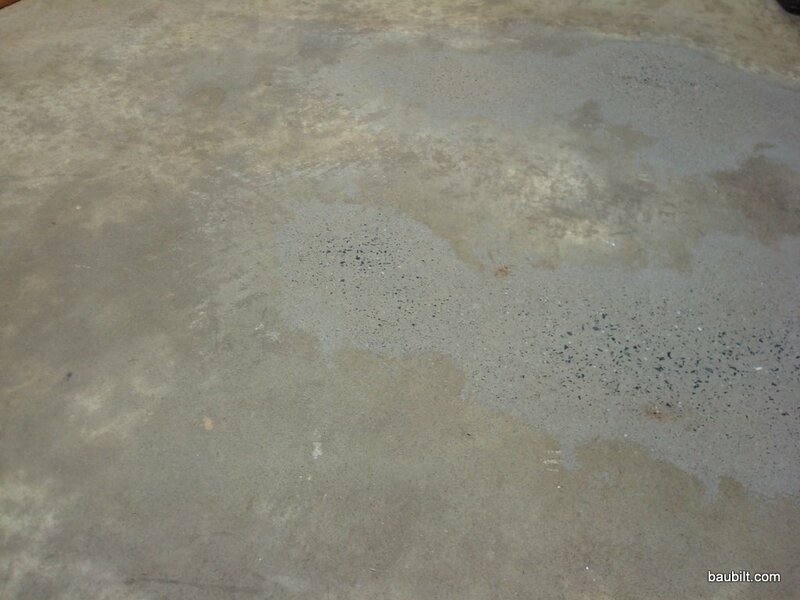 I applied Behr’s clear concrete primer and then two coats of Behr’s clear garage floor paint (an acrylic coating). The ground surfaces are visibly different from the surrounding areas, but the floor is nice and smooth. I kind of like the patina it has developed with the different patterns of discoloration and ground areas. 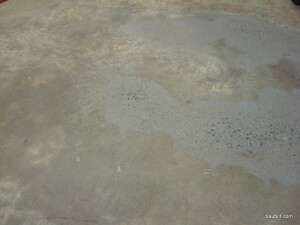 Concrete surface after grinding and polishing.